SAINT PETERSBURG, FL, November 30, 2012, Tim P. Carlson, MD has been recognized by Elite American Physicians for dedication, achievements, and leadership in health care, wound care and hyperbaric medicine. Dr. Carlson, a physician practicing in Saint Petersburg, Fla., specializes in family practice and cardiovascular education. With more than 25 years of professional experience, Dr. Carlson lends his knowledge and expertise to both his private practice and to a leading institute of higher education, where he teaches students and helps them to accomplish their goals of achieving academic excellence in the field of medicine. In addition to treating patients, Dr. Carlson serves as an assistant professor at the University of South Florida’s College of Medicine. For more than a decade, Dr. Carlson has been refining a sophisticated skill set, which currently allows him to excel professionally. He earned a Bachelor of Science in Medicine at the University of Florida, and an MD from the University of Health Sciences, Antigua. He has since remained current of advancements made in medicine as a member of the American Diabetes Association, the American Medical Association, and the American Academy of Family Physicians. He is also a community lecturer and educator through the American Medical Directors Association. 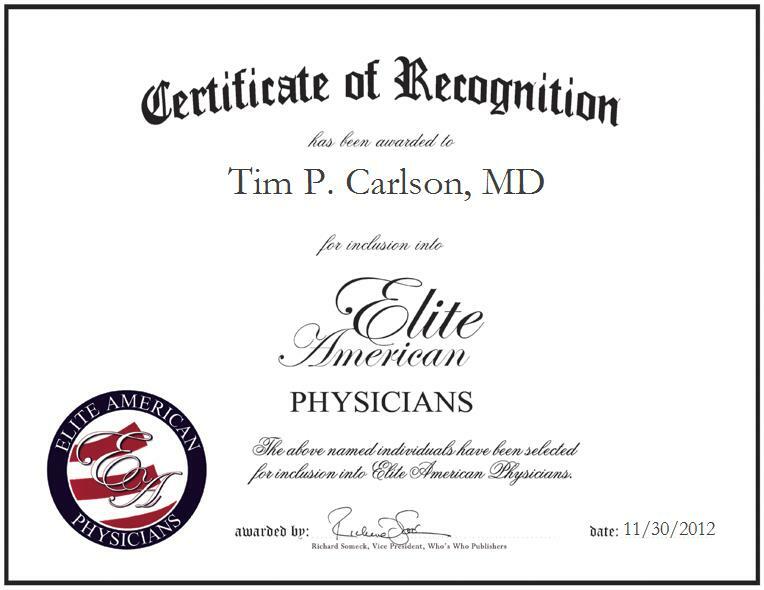 Tim P. Carlson, MD was originally selected for inclusion in EliteAMERICAN Physicians in November 2012. We are proud to be featuring Dr. Carlson again in EliteAMERICAN Physicians for 2013/2014.